Diary Big centipede! Hi it's Tess! 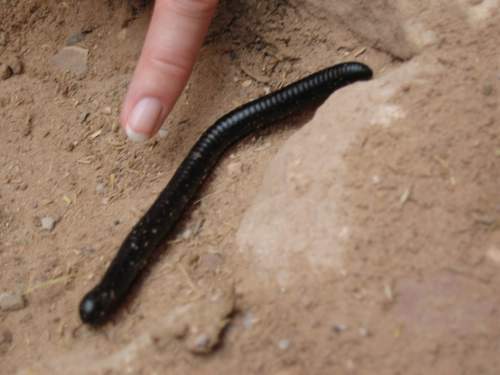 This is a giant centipiede that Mum and I saw in Petra. The rock in Petra ia absoultely amazing! There is red, purple, green and loads more colours. I thought it was man made but it was natural. There are loads of natural caves as well. I rode a donkey when we were walking up the gorge. The man just let me ride it for free! It ran and kept running into the wall! We were then walking up the track and an American Grandpa called Jerry let me get on his horse with him. When I left the centipiede I said "sorry mate you might get squished there by a donkey"( because loads of people go up to the monestry on a donkey because its a 45 min walk up the steps! In Petra we got invited to go and have some bedouin tea and it was very sweet.